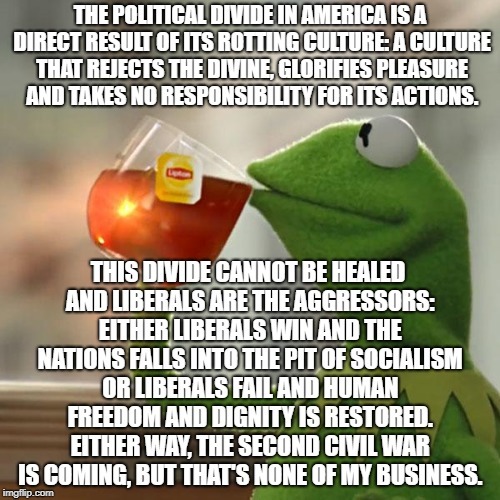 THE POLITICAL DIVIDE IN AMERICA IS A DIRECT RESULT OF ITS ROTTING CULTURE: A CULTURE THAT REJECTS THE DIVINE, GLORIFIES PLEASURE AND TAKES NO RESPONSIBILITY FOR ITS ACTIONS. THIS DIVIDE CANNOT BE HEALED AND LIBERALS ARE THE AGGRESSORS: EITHER LIBERALS WIN AND THE NATIONS FALLS INTO THE PIT OF SOCIALISM OR LIBERALS FAIL AND HUMAN FREEDOM AND DIGNITY IS RESTORED. 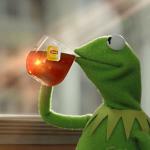 EITHER WAY, THE SECOND CIVIL WAR IS COMING, BUT THAT'S NONE OF MY BUSINESS.